Comment: The spine or cover may be slightly worn but the book is otherwise in good condition and will provide thought provoking read! Inscription on the first page, typically just a name but may include a dedication or a brief personal message. Riddling rats, meddlesome bats and six missing ravens! 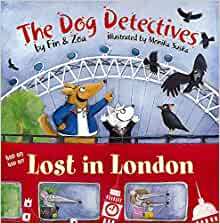 The Dog Detectives are cycling through the busy streets of London when they crash into a new case; the six ravens of the Tower of London are missing. With the help of the rat riddler, the Dog Detectives must solve the riddles and find the ravens, before it s too late! The team search amongst well known landmarks, such as Buckingham Palace, St. Paul s Cathedral, Trafalgar Square and Big Ben. Finally the last raven is found in the only place they forgot...The Tower of London! Zoa Gypsy and Fin Gypsy are the co-authors of the Dog Detectives series. Monika Suska is an illustrator whose works include I Love You for You, Noah the Boa at Large, and A Very Busy Bunny. 5.0 out of 5 starsA child's guide to London! Brilliant story! I bought this for my 7 yr old because we were going to London and I wanted him to become familiar with the landmarks he would see! Wee Shubba @ Wee Shubba's World. 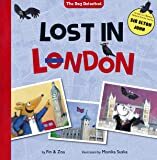 Lost In London is a fantastic children's picture. I read this with my 5 year old son. He has a obsession about London just now so this went down a treat. It's book 3 in the Dog Detective series but they don't need to be read in order. 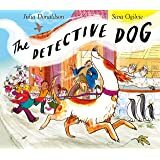 This was our first Dog Detective story and we throughly enjoyed it. The author has create a fun filled story that will little ones amused and capture their imagination. Couple this will the beautiful and colourful illustrations its exciting and fresh. I really enjoy how the author took the old myth of "The Ravens of The Tower of London" and created into something new, aswell as educating children on the myth. It was smart and exciting. 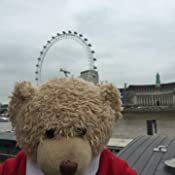 I asked my son what he liked best about the books and he said he liked following the Dog Detectives around London and seeing all the different things in London like the tower and the London eye. But he wished it was a bit longer. So overall, a thumbs up for me and a thumbs up from my 5 year old son. 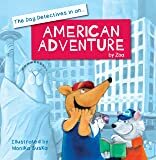 We are looking forward to more adventures by the Dog Detectives. As soon as I opened the pages to this book I was attracted to the bright colours and clear pictures adorning every page of this book. 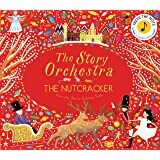 The text is in a very clear font and size, perfect for a story to share at story time in a classroom or at home at bedtime. 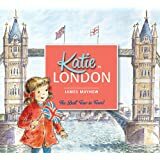 A great book to introduce children to the landmarks of London. The book is about the search for the six black ravens that protect the Tower of London, and to help with the search, the detectives are given three clues by the Rat Riddler to help find them. These clues are given in the form of a rhyme and are perfect for young children to work out. The search for the ravens is interactive with the children reading the story as they can search the pictures to find the six missing ravens too. The book also ends with a double page spread of facts about London and gives further information about London and its landmarks. I recommend this as a perfect gift for a child visiting London for the first time or one who likes to solve clues. In true Maverick publishing style this book is printed on the nicest of paper that just needs to be touched. Monika Suska has created lovely big bold illustrations that enchant the early reader from the start. 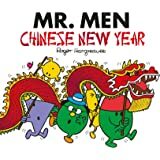 Read this book to my class of 6 year olds at story-time and they loved it. As the book progresses the children enjoyed spotting the ravens 'Where's Wally' style throughout the book. After a recent school trip to london the children enjoyed spotting the familiar sights in the book and trying to solve the clues that the Rat Riddler sets before the Dog Detectives. A good sized book ideal for sharing or little hands. Good for the early reader if they want to try to read independently. A book that should be held and read and should grace all book shelves in bedrooms and classrooms. The Dog detectives are Jack - a big lovable mutt, and his Deputy Poco Loco - a Portugese Podengo. They have to save Great Britain, as the Guardians of the Tower of London have disappeared. I loved that this book was based on the legend of the 6 black Ravens, which they still learn at school. The book is beautifully illustrated and Isaac was able to pick out some of the famous London landmarks which he had seen on a recent trip to London. In fact I think this made him enjoy the story more as he could relate to the places they were visiting. The story flowed really well and Isaac (4) took great delight in telling me that the story rhymed. Even Eliza (17 months) was enjoying it as it has an almost musical element to it. Older children would enjoy deciphering the riddles to help find the missing Ravens. You don't have to visit London to get the most out of this book. With the Jubilee and the Olympics this year the children can really relate to images they have or will see in the news but I am looking forward to taking Isaac to London again and will be using this book to fire his imagination! Lost in London is my absolute favourite in the Dog Detectives so far. The story is based around the legend of the Tower of London ravens (which dates back to King Charles II) which says that without the watchful eye of the resident ravens, the city of London is in danger of a great disaster. The story begins in rhyme with the six ravens being convinced by a lonesome bat to play a game of hide and seek. The ravens of course become lost in the streets of London, and it soon becomes a job for the Dog Detectives to track them down. The illustrations are bright and full of charm. Monika Suska has done a nice little spin on London's characters by putting them in animal form as trendy poodles, rats with mohawks, familes of foxes, bike riding bulldogs, and so on. There is lots to keep kids interested on every page. Having to solve riddles along the way also increases the interactivity of the book. This is a really delightful trip through some of London's iconic landmarks. Entertaining and educational, with a sweet ending.